Here is a sampling of the works Art Foundations 1 through Drawing/Painting I students created towards the end of first semester. Enjoy! 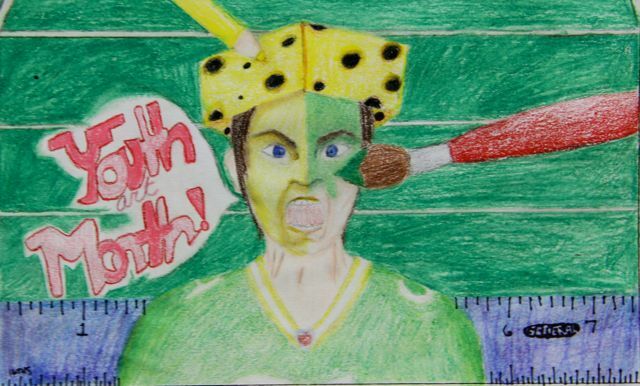 Sheboygan North High School Art Department is pleased to announce Autumn L’s, grade 11, Youth Art Month (YAM) design was one of the 16 designs chosen for the 2014 Wisconsin Art Education Association’s Wisconsin Youth Art Month Flag. There were 327 designs submitted from K-12 grade students across the state. She will be recognized on Friday, April 4th at the State Capitol in Madison. Her design will be printed on a 5foot x 3foot flag that will be displayed in San Diego, CA during the National Art Education Association Conference. 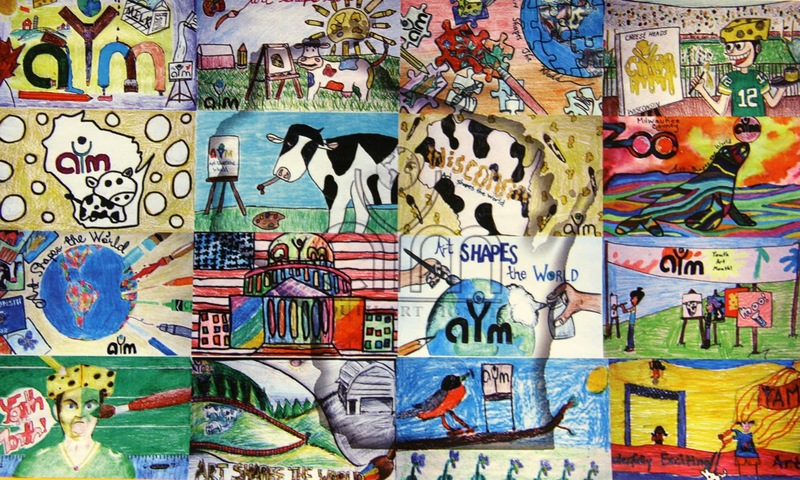 Youth Art Month (YAM) is an annual observance every March to emphasize the value of art education for all youth to encourage support for quality school art programs. YAM provides a forum for acknowledging skills that are fostered through experience in the visual arts that are not possible in other subjects offered in the curriculum. 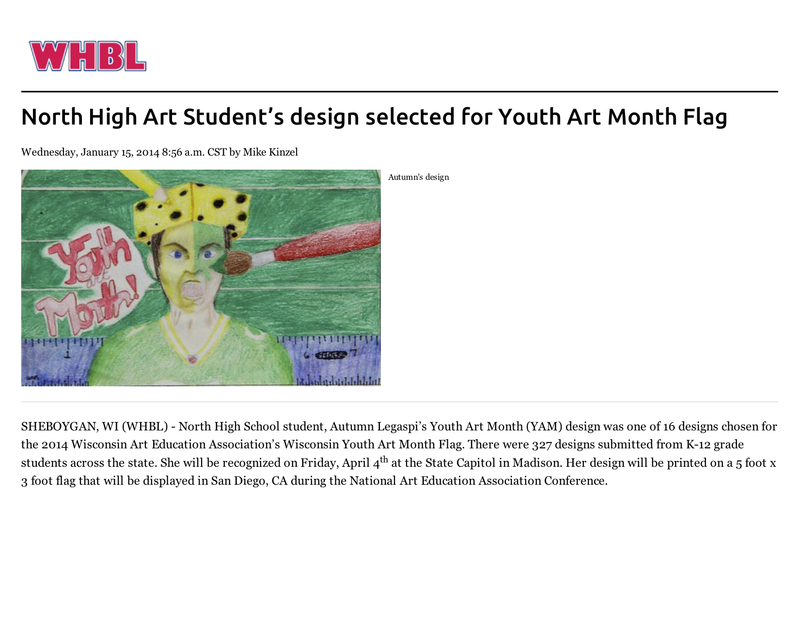 Contact Frank Juarez at 920.803.7699 or fjuarez(at)sheboygan.k12.wi.us for further information about this exhibition. Students Maggie C, grade 12, and Lauren H, grade 12, will be awarded a Scholastic Art Gold Key Award in February. A Gold Key Award is the highest honor given to a student for a work of art. These students will be recognized during the Scholastic Art Ceremony at the Milwaukee Art Museum on February 8 at 10:30am. This video was part of an art advocacy piece that merges art and fashion. Erica B, grade 12, and Karly K, grade 11, spearheaded this project to deliver a powerful message on the importance of self-expression. A big thanks to Miranda Kay Levy, Project Runway (Season 12) contestant, North High administration, the models, videographer, and everyone else who helped make this idea come to reality.